The Holiday season is here and it's not long until the post becomes very busy, full of messages of love to friends and family. This year I've made an illustrated card for White Wall Yellow Door, and all proceeds go to support a student trip to Zanzibar. A group of secondary school students from Stoke Newington, London, will be traveling across the world to help in schools in Africa. I'm glad to get the chance to support this spirit of sharing through education. 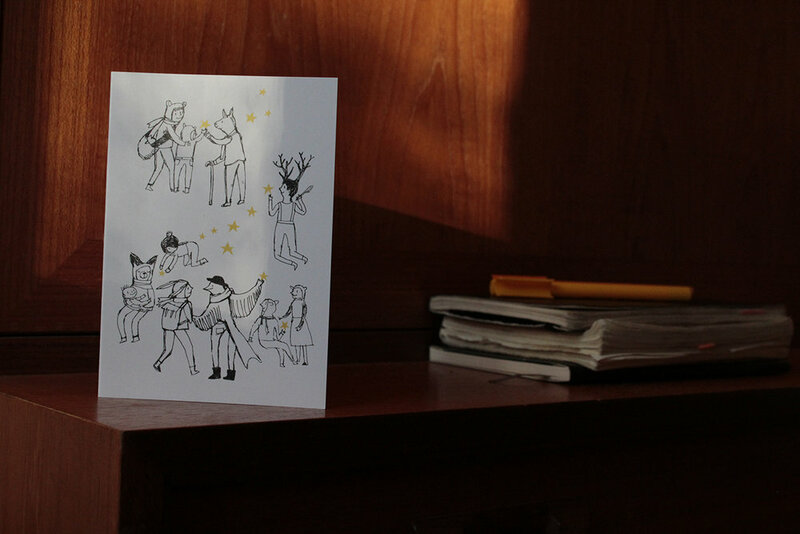 You can order these cards through the White Wall Yellow Door website SHOP. It's a great reminder to send a holiday message to people you care about, and support a life changing experience for young people. I'm pleased to now be working with a beautiful art space in Whitstable, called Frank. It is a unique place full of the best of British printmaking, craft, and design. Frank brings together a collection of objects that tell a story of the contemporary makers of Britain. Find my 'Underwater' screen print available there! Exciting news! Bat Country Collective's latest illustration show opens at The Old Shoreditch Station on Kingsland Road in just a few weeks. Hosted by Jaguar Shoes Collective, the show combines new printmaking and ceramics pieces by illustrators James Swain, Åsa Wikman, Karin Soderquist, Ashley Amery and Lucy Kirk. With a shared love of dark humour, the artists have produced work in response to the theme 'When Hell Breaks Loose', a colloquialism that lends to a number of strange and playful interpretations. The opening event is March 17th, a fun evening where you can buy art, have a drink and enjoy a night out in the heart of East London. See you there! 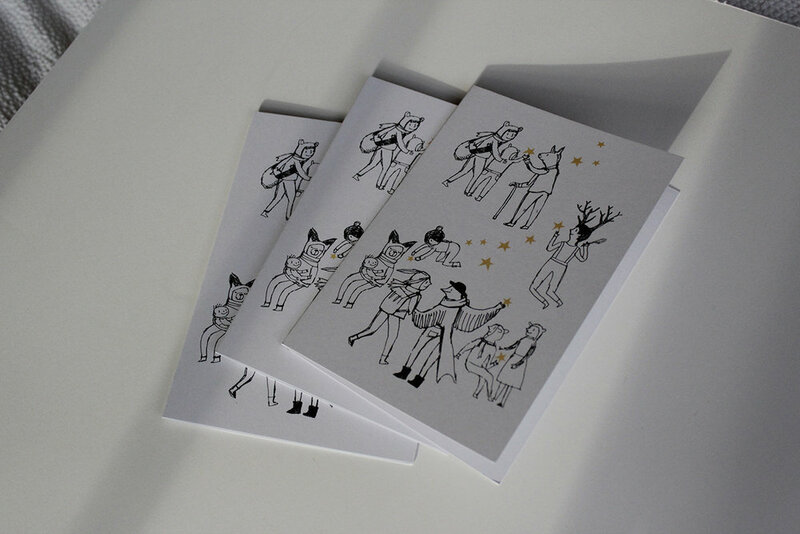 My new Greetings Card Designs are at Top Drawer London this weekend. Drawing in my sketchbook is a way for me to rest. The drawings are not for anyone. They do not need to achieve a purpose or answer a brief, but rather, they are a record of thought processes. The pursuit of an end product is not the aim. A bit like my mind, my visual diaries veer away from a linear path. Marks cover torn or folded pages, while other sections are left blank. I write to-do lists, titles of books I want to read, notes to myself, ideas, all in no particular order. In contrast to my sketchbooks, printmaking appeals to my desire to give order to curiosity; to take the wandering line and turn it into a purposeful image. In a screen print, for instance, each layer must fit together with the others. This involves planning, and though the outcome is unique each time a print is made, the overall plan remains in place so the edition can be completed. But it is in the sketchbook that my print editions begin, with lines that search for form. Here I learn how little I know about the way things look. At the same time, I gain an appreciation for the energy of searching. I become more aware of my presumptions. I may think I know what a tree looks like, but my drawing of a tree shows me I've made up my own version. A combination of observation and imagination creates a space where new shapes begin to emerge. My sketchbooks document a few visual discoveries, but most pages offer no conclusions. They record the simple act of returning to the page. As an object, the sketch book is a reminder of the imagination at work. I don't return to these drawings most of the time, but sometimes a page will stay in my mind and I will revisit it to find out whether it is the beginning of something larger, or perhaps the larger thing in itself. I need many pages to lead my line of ink on it's course across time and paper, which, more than anything, is what my illustration practice is about.